Why not come along and have a chat over a cup of tea and see if anything would interest you. We are a friendly Group who meet every week and will make you feel very welcome. During the year we hold workshops, demonstrations and hold ‘show and tell’ events. 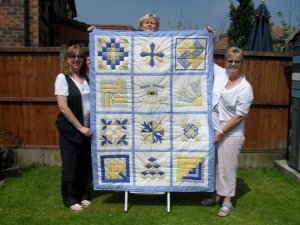 Quilting is being revitalised and those who wish to learn to quilt and/or improve their skills will be meeting up on the first Wed of each month at our usual venue. If you wish to use a sewing machine any other week, tables can easily be set up to facilitate. There will still be our usual set up for all other crafts every Wed including the first one. If you have any ideas for workshops/events/demonstrations talks etc, please let one of us know. Please contact any of the Leaders for more information. Marilyn and her hedgehog – he matches the one in her garden but eats less.